Home > Blog > Aquatic Plants > Fancy Water Lilies In Your Pond? Water lilies are colorful, intricate plants that when correctly placed into a pond or water garden will dramatically enhance its beauty. They are different from submerged plants and below are some tips for properly selecting, installing and caring for them. There are two basic approaches which are used for the installation of these plants. The first is to utilize plant pockets inside the actual pond, or to make use of plant pots which are designed for aquatic environments. The option you choose is best made before the pond is actually constructed, but the basic method for water lily planting is the same irrespective of choice. The first step to take when you’re planning to add water lilies to your pond is to figure out their size and the exact spot where the plants will reside. Water lilies will alter their own growth to accommodate to the space which is allocated to them. Both the aquatic pot and plant pot should be sized in such a manner which is in accordance with the size of the pond itself. Generally speaking, plant pockets should be approximately sixteen to eighteen inches wide with a depth of six inches. There are some excellent plant pot brands on the market which are aquatic, so you have lots of options to choose from should you choose that method. Water lily fertilization is extremely important, and should be done regularly, as it will magnify their blooms. Granular fertilizer which is time released and mixed with the soil is an excellent method to ensure the water lilies are fertilized by planting time. Some pond owners also choose to make use of tablets since they are easy to push inside the soil. However, when selecting a fertilizer be sure it doesn’t come into close contact with the roots of the plant. Correct placement is extremely important. Water lilies are not fond of excessive movement in water or splashing, so it is not a good idea to position them near waterfalls or below a stream. 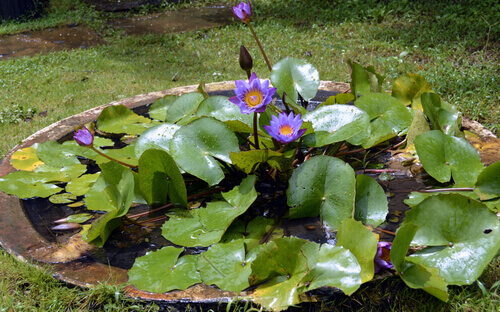 Additionally, water lilies should never be put in a place where they block water flow or debris. Once the liner has been positioned and the pond is rocked, you will want to remove any gravel which is present in the plant pocket. Those using aquatic pots will want to put it downward inside the hole that was dug out and then fill the space surrounding the pot with the gravel so that it is concealed. To maintain the health of water lilies seasonally, it is important to extract leaves which are dead or yellow in color. This will stop the decaying foliage from reaching the bottom of the pond where it can cause problems for the plants and fish. The stems should also be pruned from time to time so that they are close to the water.